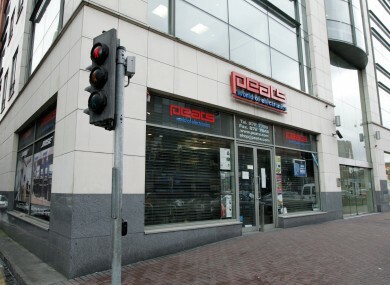 THE PEATS ‘World of Electronics’ chain in Dublin is to continue in business, it has emerged today, after a “wave of goodwill” from the company’s customers and flexibility from its suppliers. The family-owned chain of stores had announced plans to go into immediate liquidation earlier this month, but has now been able to seek a petition to the High Court to enter examinership – allowing the business to resume trading. The petition means the Rathmines store has re-opened with immediate effect, while the flagship store on Parnell Street will re-open this Saturday, 28 April. The online shop will also re-open on that date. The reopening of the two stores will mean 25 former staff will be re-employed. A liquidation meeting set for tomorrow has now been adjourned. Chairman Ben Peat said the announcement was being made with “great joy”, hailing the “phenomenal” reaction the company had received after announcing its closure earlier this month. In particular, the flexibility of our staff, our suppliers and other creditors has allowed us to re-evaluate and re-design our business model to establish a lower cost model for future operations. Peat said the decision to concentrate the business in two outlets would allow those shops to sell the stock that had been accumulated in the 11 previous outlets, “whilst also reducing our redundancy outlay”. “It will enable us to operate as a much leaner business,” he said. Peat added that while he was disappointed not to be able to recall all of his former staff, some of the former staff had already found alternative employment with other retailers based on the reputation of the Peats chain. “I also have to thank the thousands of Peat’s customers who expressed their sadness and disbelief on the closure and extended good wishes to me and my family both directly and indirectly,” he said. Their kind words and support were a major factor in giving us confidence and belief that the core values that we hold dear still matter to consumers. Three generations of the Peat family have worked in the business up to its closure. With an on-going family involvement and some fresh investment, I intend to drive the business forward while retaining the ethos and character of the business that made it a household name in Dublin. Email “'Wave of goodwill' sees two Peats electronics stores saved”. Feedback on “'Wave of goodwill' sees two Peats electronics stores saved”.